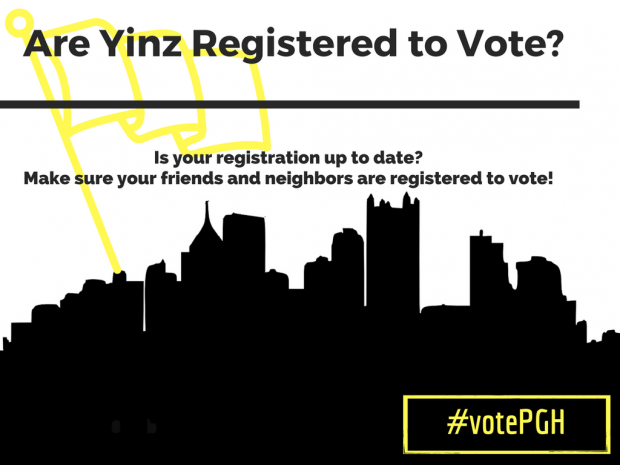 You are here: Home / Civic Engagement / Are Yinz Registered to Vote? Are Yinz Registered to Vote? I’ve spent the past few days at home with the flu, which has given me plenty of time to watch the Presidential debate previews, documentaries on the candidates, the debates and the debate recaps. Twelve years ago, I had never voted, but a few month after attending a candidate MeetUp at the Church Brew Works, I quit my job and went to work full time on the presidential campaign. Today, September 27 is National Voter Registration Day, a perfect excuse for a post on registering to vote. October 11, 2016 is the LAST DAY TO REGISTER TO VOTE before the November General Election. If you plan to vote in Pennsylvania on November 8, you MUST submit your voter registration by October 11. This is the first presidential election that you can register to vote online in Pennsylvania. You can register to vote online here: http://bit.ly/25tqFa3. Fill out, print and mail a voter registration form. Click here to use our handy voter registration tool provided by RockTheVote. RSVP & invite your friends to attend this Election Day Event on Facebook. It is my goal to get 1000 people to RSVP to this event before election day. Pole 2 Polls: Help craft hand made signage. Like the League of Women Voters of Greater Pittsburgh on Facebook. Know of other groups or organizations that are planning activities around voter registration or election day? Please leave a comment below.